A new friend recently traveled to Greece and Italy and generously brought us back a few delicacies, including coffee, porcini mushrooms and Greek candy. Though I haven’t used the mushrooms yet, the coffee and candy (loukoumi) are delicious! 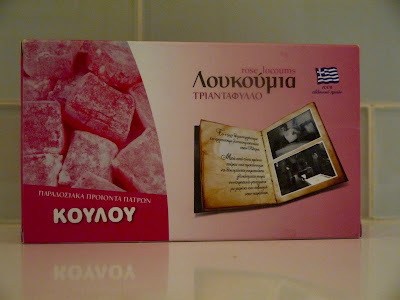 Loukoumi is best described as an even better version of Turkish Delight. Like the latter, it’s a jelly based candy, but is less sweet, chewier and has a better texture. I like it so much that I found it online, am planning to place an order and am even giving some away as gifts! After all, who would love what is essentially the nectar of the Greek gods?